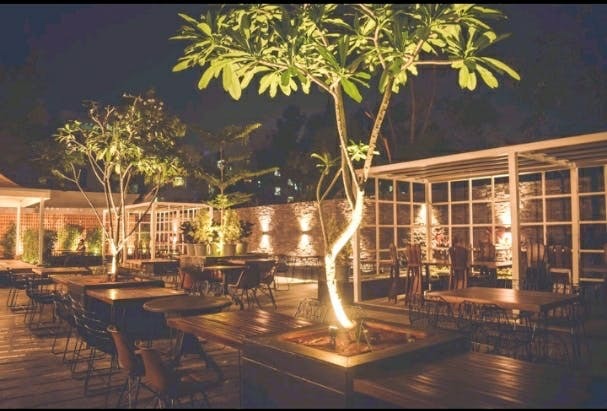 Welcome Urbo, the newest pub in town to take Balewadi neighbourhood by storm. For those who don't know, Urbo has nothing to do with the word urbane. Well of course, it's quite happening and decked up, but each letter in Urbo has a meaning. While U stands for 'ultimate dine', R over here stands for 'recreation and chill'. Similarly, B stands for 'bespoke deck' and O stands for 'open street'. The place, by all means, is extremely posh, supreme and lively. There are four sections - a family place for your sit-down dinners, a bar and a smoking area, a spectacular dance floor and a gorgeous VIP space with plush, high-end decor. Needless to say, if you opt for the VIP section, you have to pay extra cover charges. Coming to the food, the menu at Urbo is very limited and purely vegetarian. We loved their paneer khaw suey tikka and Thai chilli water chestnut, both for INR 281. Pizza lovers we highly recommend you try the vegetable barbecue pizza for INR 481. Don't skip the velvet cream fruit basket for INR 381 for desserts! The alcohol is tad bit expensive. Cocktails start from INR 451 and beer start from INR 200 for a pint. We did love their whiskey-based crowned head concoction. It's a mix of bourbon with fresh rosemary reduction, whiskey infused oranges, egg whites and hint of bitters. As we mentioned, the food menu is extremely limited and there's isn't a lot of bar grubs. However, we hear they are expanding the menu within the next couple of months. So, yay!